The Barton family has been farming on the banks of a San Joaquin Valley river for 105 years, and for the first time they face the loss of hundreds of acres of walnut orchards because of potential flooding that’s actually at the behest of the state of California. Don Barton, President and Managing General Partner of Gold River Orchards in Escalon, says he still finds it hard to believe the state would take such action, which the State Water Resources Control Board is considering. The “unimpaired flows” at issue are intended to help restore the Northern San Joaquin Valley rivers’ fisheries. Conservative estimates show the water plan will require over 350,000 acre-feet of river flow in dry years and up to 1.7 million in wet years — a 300% increase over the current amount now dedicated to environmental flows. Area growers like Barton argue the real problems for fish are limited spawning areas, voracious predators, and rock-lined Sacramento-San Joaquin Delta channels that offer little protection for native fish migrating to the ocean. However, the State Water Resources Control Board is making it clear that it won’t vote next week on the much-disputed proposal to require the higher river flows for improving water quality in the delta, the Modesto Bee reported Thursday. Felicia Marcus, who chairs the water board, said in a letter Wednesday to the California Natural Resources Agency that final action will be taken at a board meeting later. However, hearings Tuesday and Wednesday in Sacramento are still set for considering comments on the final amendments to the Bay-Delta plan, which would require dams in the Sierra Nevada to release 40% of flows in the Tuolumne, Stanislaus, and Merced rivers from February through June to help young salmon swim downstream to the ocean. 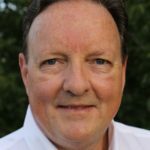 In her letter Wednesday to state Natural Resources Secretary John Laird, Marcus said Tuesday’s hearing will provide the final opportunity for comment on the proposed action. Barton says the details of the plan are bad enough, but he’s even more disturbed by the underlying philosophy. “Never before in recorded history has a society deliberately decided to destroy its own food supply,” he says. 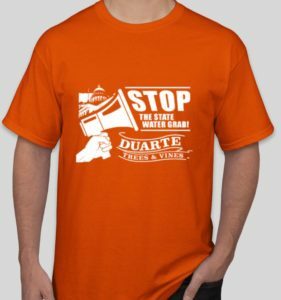 Duarte Nursery employees will be decked out in orange T-shirts for Monday’s protest, which will be held at noon at the state capitol in Sacramento. John Duarte is similarly disturbed. The president of Duarte Nursery in Hughson says the pendulum toward restoring the environment has swung too far. The plan has ramifications that Duarte says people with no connection to farming have not considered. For example, what about the farmworkers who depend on those jobs to feed their families? “You can’t separate ag from the people who work in ag,” he says. Duarte says the plan is an enormous issue for his employees, though even he was taken aback by the depth of their commitment. The nursery made sign-up sheets available to employees wanting transportation to Monday’s protest. Stanislaus County Farm Bureau, along with a few other Farm Bureaus in the region, is providing free bus transportation to the demonstration. Initially, about 100 employees signed up, so Duarte requested two buses. But earlier this week Duarte had to call Farm Bureau officials back; he needed two more buses to handle his employees’ demand.